Each week one of our contributors gives you a sneak peek into their studio, creative process or inspirations. We ask a related question of our readers and hope you'll leave comments! As an incentive, we offer a prize each week to bribe you to use that keyboard and tell us what you think. The following week a winner is chosen at random from all eligible entries. Please email Heather to claim your prize. Welcome to the studio of Mary Harding Jewelry. 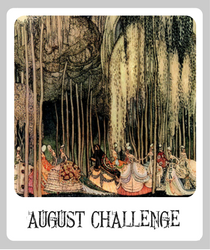 I am delighted to host this week's Inside the Studio post. July has been a busy month and I have been in and out of my studio teaching classes, and participating in a craft show for the first time in several years. Last week I posted some of the raku beads that I made as color samples for a collaborative Raku Bead firing one of my classes participated in. You can read all about it here. 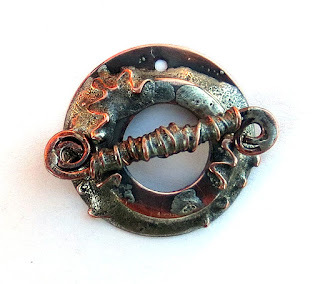 Now that the classes are over and no shows are on my horizon, I have been busy making some new toggle clasps with soft solder and copper sheet. I really enjoy soft soldering because it is such an intuitive and impromptu medium. 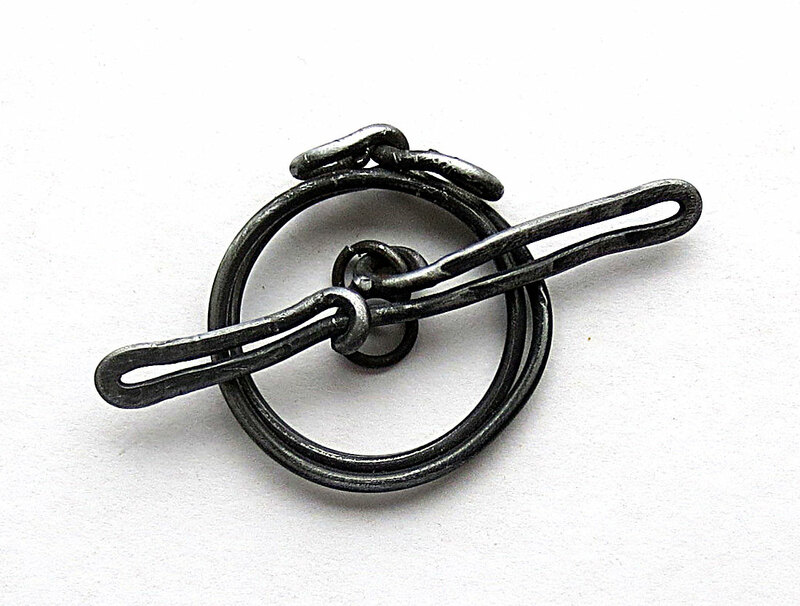 I have been working on some clasps that are similar in feel to one that will be published next month when Stringing magazine releases its Best Beads of 2015 issue. I called that one Poetic Grunge. The series I have been working on is inspired by that clasp and by the book I have been reading for Andrew Thornton's Inspired by Reading Book Club---Swamplandia. I wanted to capture my interpretation of what the author, Karen Russell, refers to as the Sawtooth Age. 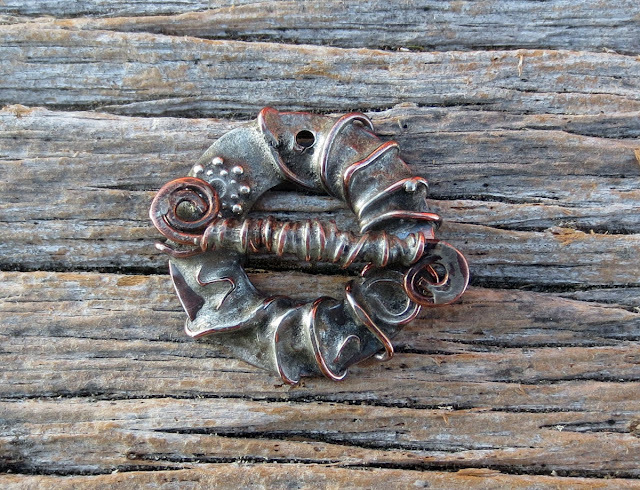 So I used a saw type motif through out this series of clasps. For the ones pictured above I flooded the clasps with soft solder and then added the copper saw tooth wire bits by placing them on the solder and then reheating it. For a more lyrical effect, I wrapped copper wire around the clasp after completing the basic soldering. I think it almost looks like some kind of exotic tropical flower, as well. 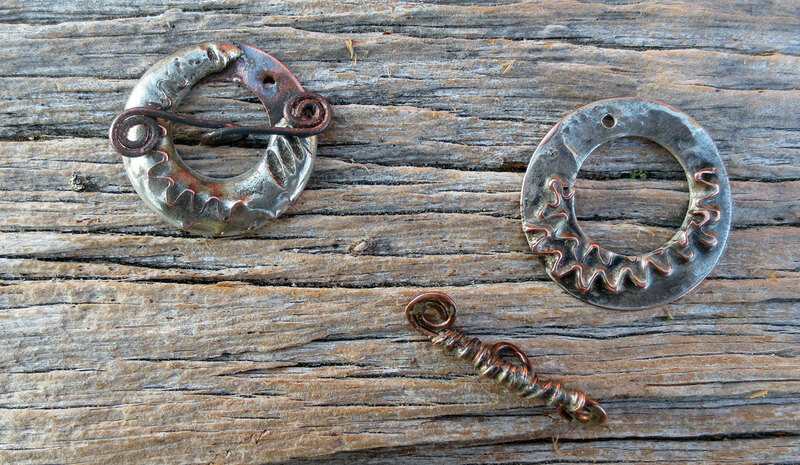 I floated bits of copper in the solder to create the texture of the alligator hide in the two clasps pictured above. This clasp is more 3 dimensional and has two layers of saws. The bottom layer juts out from the surface of the clasp but the saws are soft and smooth due to filing and tumbling. I have also been experimenting with toggle clasps made from steel rebar wire. I was inspired by Keith Lo Bue's online class Steeling Beauty and his lessons on playing with the wire. I have tried out a few clasps by bending and forging the 16 gauge steel wire and plan to continue on seeing what I can come up with. Here are a couple of examples of what I have been trying out. There is no solder on this clasp. All the shapes are made by bending the wire with strong linesman pliers. 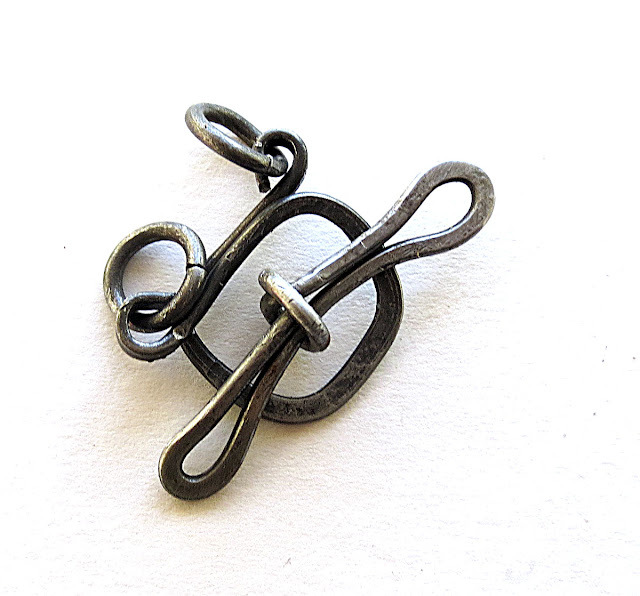 A square toggle clasp wrought from 16 gauge rebar wire. Now for my question: Is making work in a series something you like to do? Leave a comment below related to this idea and you will be automatically entered to win a $20.00 gift certificate to my Etsy shop. I have been trying to do more of that lately. I think it is good for branding and creating interest in purchasing now rather than later. Your clasps are wonderful. You have a multitude of talents! Mary, these sawtooth age toggles are phenomenal. Quite a change from your nature inspired work! I love the textures and shapes and the grunginess of them. I like the idea of creating a line of work and have been thinking about but am not "there" yet. These are marvellous, Mary. Wish I could win!! very cool clasps! Working in a series happens very naturally for me. I get interested in a certain look, material or technique and want to experiment with multiple variations of the same idea. very cool clasps! Working in a series comes very naturally to me. I get interested in a certain look, material or technique and like to experiment with multiple variations on the same theme. Yes I've made pieces that I would consider a series. Generally a series will percolate out of having a collection of certain beads, thinking through a design and then make pieces to use up all the particular materials. Love your pieces, Mary. 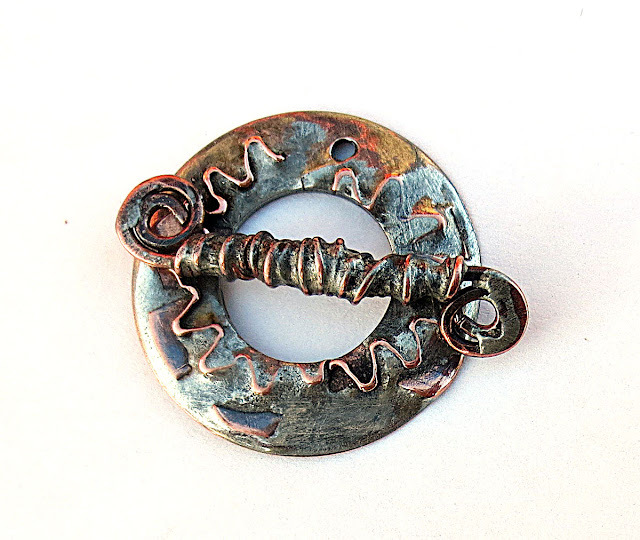 Melting solder on copper is sooo much fun, thanks to Richard Salley. As for steel wire - another favorite thanks to Brenda Schweder. It is such a forgiving metal to manipulate. Only wish we didn't have to take the extra time for cleaning and then making it rust-proof. But the end result of this metal always makes me want to do more. I think working in a series is a good idea but I don't always have the patience or time to just play with ideas. I definitely want to do more of that! Ans I love the saw tooth "melty" look, very nice. Wonderful patinas. I love the organic of the swirls and zig-zags. I have made a series of ocean-themed jewelry pieces using art pendants/focals from one artist with a different technique for each one---wire-wrapping, hand-knotting, leather cord, stringing, & combinations thereof. 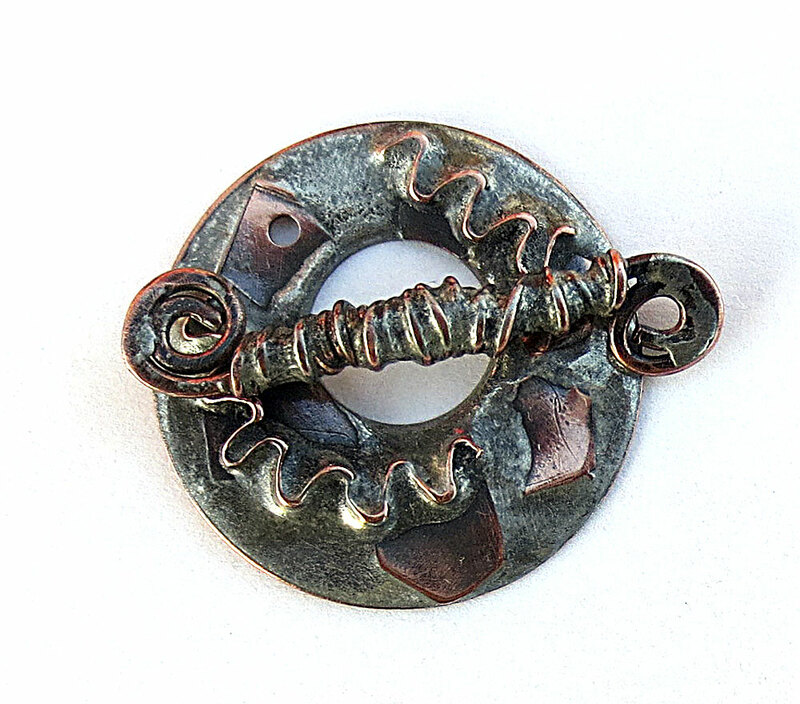 I love your new solder on copper toggles and it is something I have been wanting to try. Yours are especially rustically beautiful! Will you be listing them soon? Thanks for sharing them. Really like your soft solder clasps. I have made several pieces from the same beads but not sure that is what you mean by a series. Theme-wise haven't done that yet. I don't usually work in a series, but I have been considering making jewelry using different designs for similar components. Just for a change of pace. no, not at all. But I like your stuff. I just create whatever I am feeling. Hello from Julie, of Uglibeads!